Home / C-Life / Summer / Extreme heat can cause tire blowouts – Here’s some advice on how to prevent these blowouts. Extreme heat can cause tire blowouts – Here’s some advice on how to prevent these blowouts. In summer heat conditions as the pavement temperatures soar, it’s important to regularly check air pressure. Make sure proper tire inflation to manufacturers’ specifications is maintained. Manufacturers recommended tire pressure can be found in vehicle owner’s manual or on vehicle door plaquard. 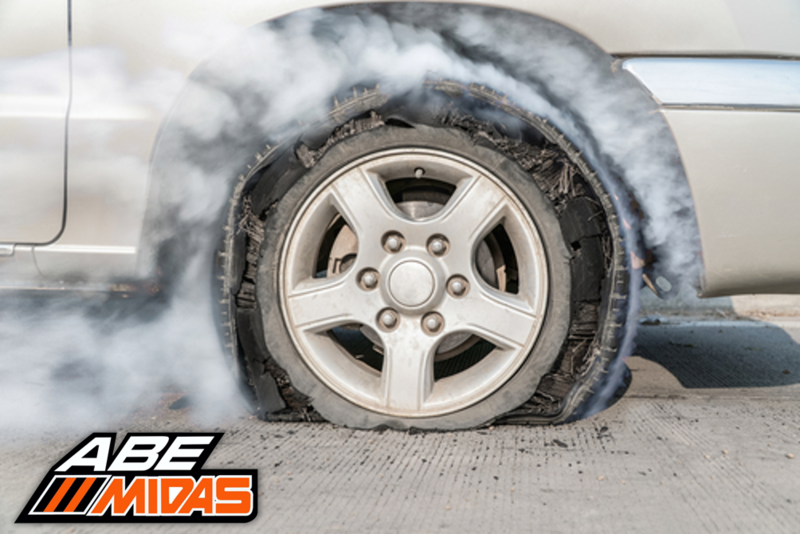 It’s important to note that under-inflated tires increase the risk of tire blowouts. Under-inflated tires run hotter than tires inflated properly to the manufacturer’s recommendations, and in summer heat conditions tire temperatures can get high enough to cause serious damage to the tire. In addition, under-inflated tires will result in poor gas mileage. You can reduce the risk of blowouts by slowing down on the highway and taking curves or corners more gently. Nitrogen Inflation which is offered at most Tire locations has been proven to help vehicle tire temperatures run cooler than standard air in extreme heat conditions. Excessive heat can also cause badly worn or old tires to fail even while exercising safe and careful driving practices. Not all rubber compounds are created equal either. Tires have separate ratings for temperature, tread wear, load capability and speed. Temperature grades represent a tire’s resistance to heat and its ability to dissipate heat when tested under controlled laboratory test conditions. The grades from highest to lowest are “A”,”B” and “C”. The grade “C” corresponds to the minimum performance required by federal safety standard. Therefore, the “A” tire is the coolest running, and even though the “C” tire runs hotter it does not mean it is unsafe. The temperature grade is established for a tire that is properly inflated and not overloaded. Correct tire pressure. This varies by car model and tire brand. The information is found in the vehicle’s manual or inside of the driver’s side door. Keep a tire gauge handy, and check the pressure weekly. If the car has a pressure monitoring system, take action as soon as the warning light goes on. Repair or replace leaking tires immediately. Tread monitoring. Check the wear of the tire treads regularly. An easy way to test for wear is to place a penny between the treads. If the top if Lincoln’s head is visible, it means the treads are less than 2/32 of an inch, and the tires need to be replaced. Uneven wear or raised sections of tread also indicate replacement. Checking the manual. Every vehicle comes with an owner’s manual that recommends the replacement interval for tires. Tires should also be rotated each season to avoid uneven wear that may lead to blowouts.